Millard West Spring Activity Yard Signs Now For Sale! New Millard West yard signs for spring activities are now for sale! 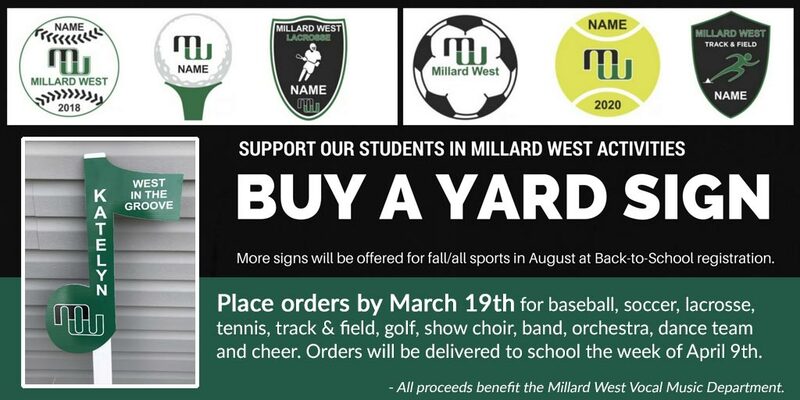 Order your Millard West Yard Sign to support your student in spring activities by March 19th. Don’t miss out! In this order, yard signs for baseball, soccer, lacrosse, tennis, track & field, golf, show choir, band, orchestra, dance team and cheer will be offered. Each sign is $30. Orders will be delivered to the school the week of April 9th. More signs will be offered for fall/all activities in August at Back-to-School registration. This is a great way to support our Millard West athletes and musicians. In addition, all proceeds benefit the Millard West Vocal Music Department. DON’T DELAY! Order your yard sign today and pass this on to a friend!